In May, several thousand ravers congregated on Rustaveli Avenue in the heart of Tbilisi to protest the police raid on two of the city’s most popular clubs. Led by the White Noise Movement and supported by techno communities across the world, they called for change to Georgia’s policy towards drugs. But did the #RAVEolution live up to the high hopes of its organisers? For two days in May the dilated pupils of clubbers around the world were turned towards Tbilisi. There, on the square in front of Georgia’s Stalin-era parliament building, the crucible for social change in the country for generations, something extraordinary was taking place. Some ten thousand young (and not-so-young) revellers had shut down the centre of the city with an impromptu dance-demonstration, a #raveolution, as the hashtag went, in protest against Georgia’s absurdly draconian drug laws and a midnight raid that saw hundreds of gun-toting riot cops descend on two of the city’s most popular clubs. For a moment, it looked as if sweeping changes were about to come this tiny, conservative country in the Caucasus. But two months on and much of the promise of the protests seems to have run out. 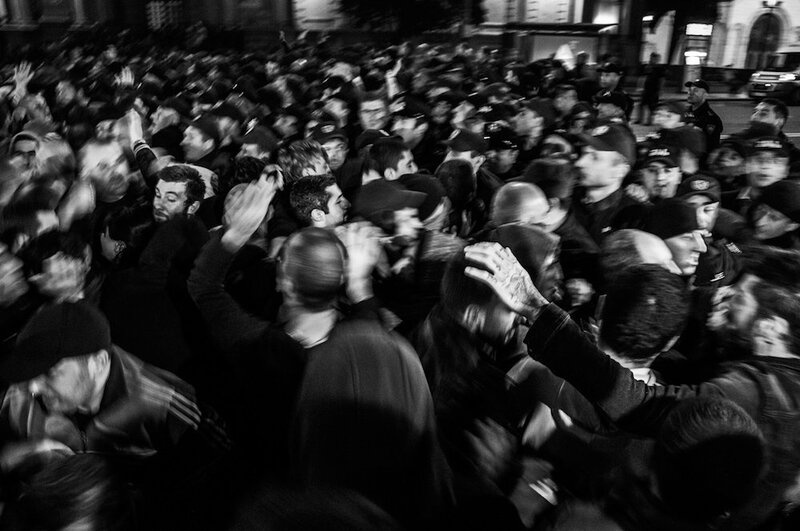 After facing a serious challenge to its authority, the Georgian government have for now seen off the threat posed by Tbilisi’s mobilised ravers, kicked the drug policy debate into the long grass, and at least temporarily broken the power of the White Noise Movement, the main organisers of the protests. The #raveolution of 12 and 13 May ended in an uneasy stalemate, but for the activists, clubbers and creative that made it happen, the struggle has moved on to a new phase. The White Noise Movement, dedicated to repealing Georgia’s harsh drug laws, began in 2016. It emerged from a successful campaign to remove prison sentences for possession of marijuana, and in response to continuing police harassment of young people suspected of using drugs. 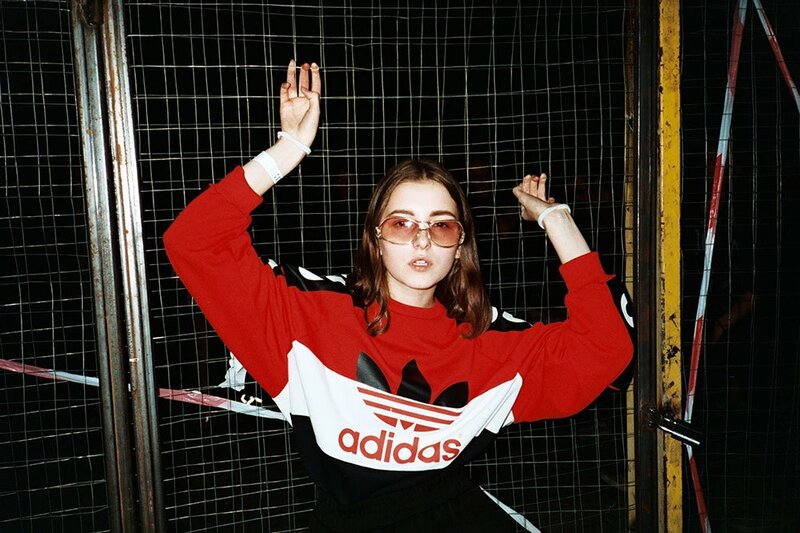 It’s spiritual home was Bassiani, Georgia’s era-defining techno cathedral, the ‘Berghain of the Caucasus’, which was the main target of the 12 May raid that led to the #raveolution. “It was a very hard time for clubbers,” explains Naja Orashvili, one of the founders of Bassiani and a lynchpin of White Noise. “After they would leave the club the police would chase them and take them in to have their urine tested.” In Georgia, having any trace of a controlled substance in your blood is enough to convict you for possession. Soon, White Noise was an experienced campaigning organization, with a detailed platform for drug reform that went far beyond ‘rights for ravers’, and aimed at a deracination of the post-Soviet system that impacts everyone in the country: Georgia has the highest prison population in Europe, and every third inmate is incarcerated for drugs offences. 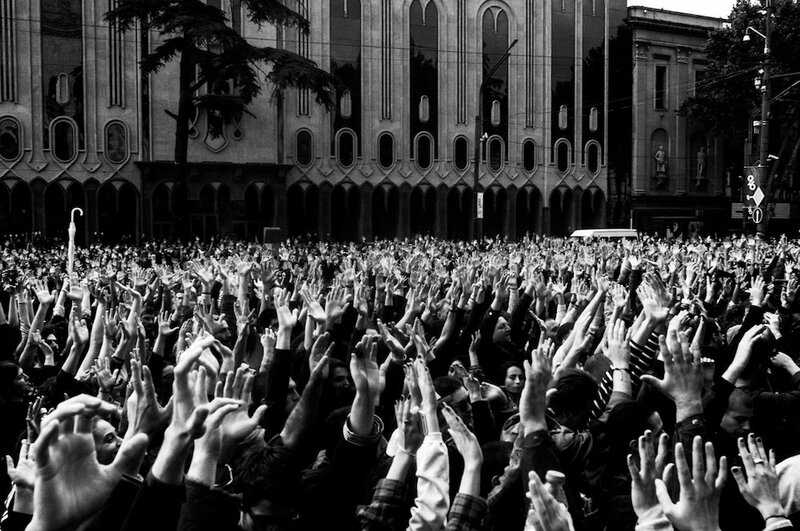 The movement was capable of mobilising the Bassiani Generation, with tens of thousands of mainly young and well-educated young people coming out to demand change at its rallies. By late 2017 it seemed to be working. Several high profile MPs initiated a draft law on drug policy reform that had basically been drafted by White Noise and its partners. Hopes were high, but a sustained attack from Georgia’s all-powerful Orthodox Church and its allies in parliament succeeded in stopping the draft law in its tracks. Then, in spring, clubbers in Tbilisi began to fall mysteriously ill. “We didn’t know about fentanyl,” says Bassiani’s Orashvili of the synthetic opiate that is deadly in even tiny amounts. But, after four clubbers in Bassiani lost consciousness, the club knew something was wrong. “We saved them, out staff is highly trained in first aid. I put out an alert that something bad is out there. I called the right people in the Ministry of Internal Affairs, saying there was a new substance out there that was not okay, but they didn’t react,” Orashvili says. On 11 May, with the drugs deaths high on the agenda, and Georgia’s ruling party split by conflicts between liberals and conservatives, someone gave the order to raid Bassiani and another club, Café Gallery. 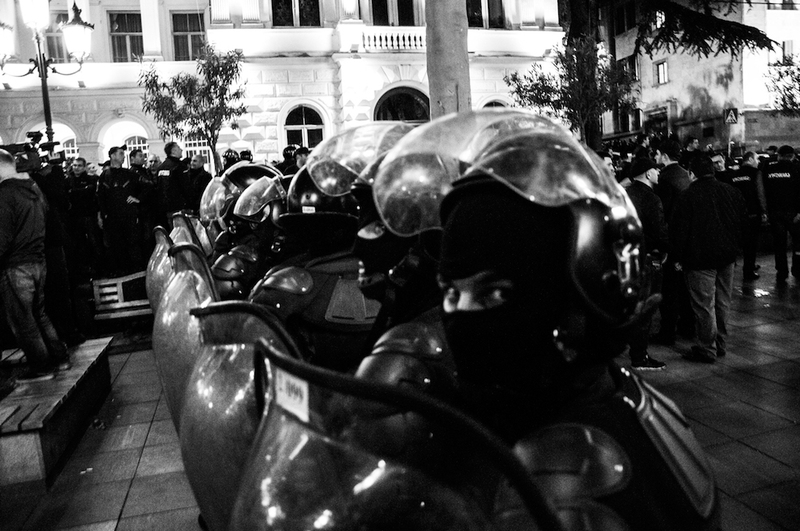 “This kind of mass police operation is not something we have seen in Tbilisi’s streets,” says Verdzeuli of EMC, who is preparing a report on the lawfulnessof the raids. “It is not obvious to us why the government chose to demonstrate this kind of repressive police power.” But lawful or not, to the Bassiani generation the raids were a direct assault on a way of life. Within minutes of the first images of camouflaged men with assault rifles raiding the clubs, the young people of Tbilisi took to the streets. By the early afternoon of 13 May, more than ten thousand revellers had completely shut down the area in front of parliament on Tbilisi’s main street, blocking traffic in the centre of city and taking the government by surprise. 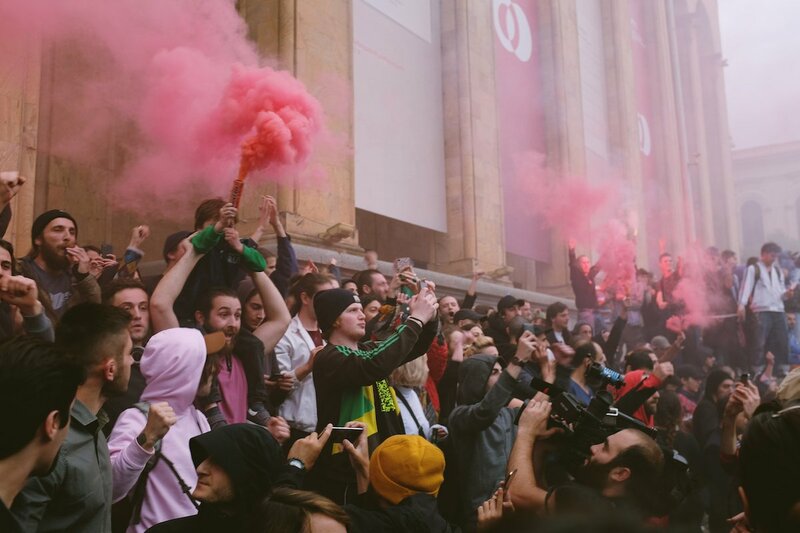 As dance music echoed through the streets and the international media picked up on the story, the political costs of the club raids were becoming apparent, and it looked like the demonstrators were going to force the government to the negotiating table. But as the evening drew on, reports were coming through of a more worrying development: Georgia’s right wing street groups, implacably hostile to the liberal, gay-friendly world of the Tbilisi club scene, had begun to arrive. Although only a few hundred strong, these counter demonstrators came looking for a fight. Chanting “Georgia without pederasts”, police had to be deployed to keep them away from the ravers in front of parliament. As the counter-demonstrators became increasingly violent, Interior Minister Giorgi Gakharia arrived to negotiate with the protest leaders—Orashvili, Verdzeuli of EMC and several others—in the parliament building. “Gakharia had the radio in his hands the whole time. Every two minutes he was talking to his people, saying he can’t manage the situation with the neo-nazis. Saying he would have to use force against them if the clubber protest leaders didn’t make a decision to go home. He said the decision would be on their shoulders. ‘Yes I will protect you clubbers, but it will mean I have to use my powers. It will mean blood and the escalation of the situation and it will be your responsibility,’ he told them,” Subeliani explains. With these vague assurances in hand, White Noise, Bassiani and EMC took the decision to de-escalate — a decision some in the movement deeply regret. Interior Minister Gakhariahimself addressed the crowd. In a first for any Georgian politician, he apologized to the assembled ravers, which was greeted with rapturous applause. The apology, the tentative promise of drugs policy reform, and the threat of violent right wing protestors was enough to bring events to a close. In a dramatic finish, the ravers were let into parliament through its massive metal gates. In the central courtyard municipal busses awaited to ferry the demonstrators past the lines of neo-fascists screaming obscenities. “It was then,” says Subeliani, “that I wrote my famous three word statement, that I feel betrayed.” Looking back on the events, many in Georgia believe the government deliberately used the threat of violent counter protestors to get their way. By keeping the opposing groups apart, they got to play the responsible peacemaker, even though their heavy handed tactics in the raids had precipitated the crisis. Nevertheless, with Gakharia’s apology in hand, many of the protestors felt like the #raveolution had ended on a high. But for the organisers, convinced drug reform was just around the corner, the come down was severe. It’s not clear whether White Noise will survive as a movement in it’s current form, but most of its leaders agree that a change of strategy is needed. “We have 53,000 daily injecting drug users. That is more than 2% of the adult population. We are third in the world for opiates. The Russian federation, the Seychelles and then Georgia,” says Subeliani. “These are the people who need reform the most”. The #raveolution may not have lived up to the high hopes of its organisers, but its impact should not be ignored. The outrage unleashed by the club raids and years of police harassment took the government by surprise, and the scale of the demonstrations presented a major challenge to its authority. Bassiani is back up and running, more popular and influential than ever before. The government will think twice before sending riot police into any more clubs. Also, even if White Noise’s dreams of a fully reformed drugs policy are still a long way off, it becoming increasingly apparent that the current system will not survive, and some concessions are likely.